UPDATE: Re-posting to include a video of the vintage recording by David Hickopf. We also recorded it, see Dos talesl on the cd Nervez. Goldfaden was known for lifting songs from the folk tradition and putting his name on them; somebody did indeed originally compose this song but it quite likely wasn't him. 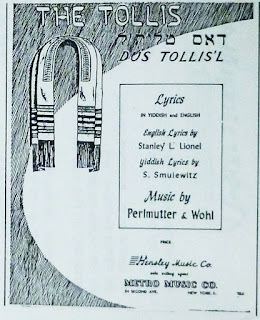 On the Mendele listserv the Mloteks noted they had a version of this song published in 1906. Mariam Nirenberg has an a cappella version of the song; if you listen to hers first and then Hickopf's you see how an arranger puts meters and harmonies on top of a melody which was originally a single sung line. The tallis is a dear thing that belongs to the Jew. Everyone has many hopes bound in it and is happy with it. Oh, dear tallis, heart's consolation, you've listened to a lot of prayers. Of all the bitter hearts, you well know Jews' pain. Companion in belief, you are my eternity. I will be your eternal garment.